In 1836, 187 Americans and Texicans stood against the attack of Santa Ana's 7,000-man army for more than 13 days. 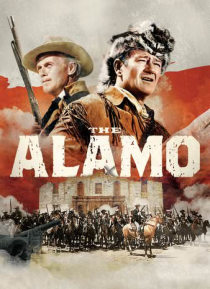 This epic film deals with how those men happened to be inside the mission--now a converted fort--in the small village of San Antonio, Texas, and how this led to the tragedy at The Alamo. The historical players at the fort include Davy Crockett, James Bowie, Sam Houston and Col. William… Travis. The film is historically faithful (as few films are) to the historical events.